This is a cross post from the SEA Expedition Blog. The Junior Watch Officer, or JWO, stage of the trip is now in full force. Each student must take the ‘con’ and apply everything we’ve learned throughout the trip to run the ship for a full watch. As this stage is extremely effective in realizing what were capable of, it also serves as a reminder that our epic exploration of PIPA is nearing its end. As our first full day outside PIPA concludes, and we make way for American Samoa, I can’t help but look back on the amazing environment we had the opportunity to explore. After our adventure through this pristine wilderness, we are representatives of the oceans, responsible for spreading the knowledge that we’ve gained to show the significance of protecting our oceans. I thought I would take this opportunity to shed light and hopefully embarrass one of the notorious Tweedles. While at anchor at various islands throughout our adventure, the Tweedles (Camrin Braun and Tane Sinclair-Taylor) were seldom found on board. From dawn until dusk on most days they were off sampling sharks and mantas for isotopic analysis, spearing targeted fish, or reeling in delicious yellow-fin and wahoo. On the passages between the islands however, we all had the opportunity to ask them questions and get to know them a bit. Among other things, Tane and Cam single handedly kept moral extremely high throughout the trip, with their constant ‘married couple’ banter over who’s making the coffee, or general meal-time shenanigans that everyone desperately needs after a long watch. Me: How did you get into doing what you do? Tane: After I did my honors in marine biology and ecology at Queensland University in Australia, I guess I wasn’t quite ready to do a Ph.D and preferred field work instead, so I pursued that and got on as many trips as I could. Working for James Cook University, Australia Museum, and eventually got longer and longer contracts. Me: How did you meet Cam (WHOI/MIT Ph.D student)? Tane: Cam was a student in our lab in Saudi, he did his master there, and he stayed with me and a friend, and ever since then we’ve been working together on all sorts of projects. His supervisor at WHOI is one of our main collaborators. Me: Is Cam your best friend? Tane: No. He’s one of my nemeses, you’re the other one, Pete! Me: What has been the craziest moment of the trip so far? Tane: When you had the con, Pete. Ha! A lot of things were happening, double reefed the main – it was absolutely terrifying. Tane: Probably Winslow Reef, because we didn’t really expect to go there at all, and when we got there we were able to anchor [In the middle of the Pacific, about 180nm from any other land mass! 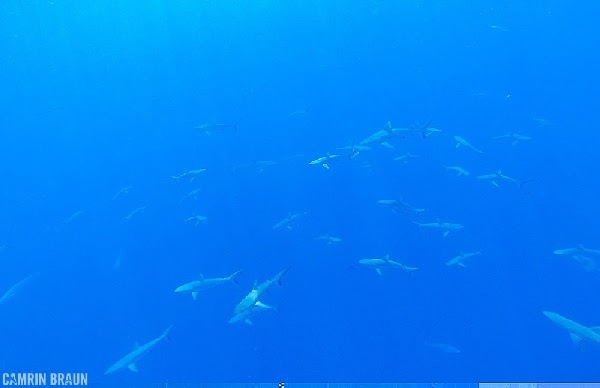 ], there were plenty of sharks for us to sample, and lots of good fishing. Me: How many sharks did you see there? Me: If you could be any type of shark what would you be? Tane: I’d be a tiger shark. You know, tropical waters mostly, pretty big—around 6–7 meters. I don’t really like the cold so great whites… not for me. Me: Whats your favorite board game, Tane? Tane: You’ve got to be joking, Pete. I don’t have a favorite board game, I don’t have time for board games. Me: You don’t like games? You mean you don’t like fun? Tane: You shouldn’t have time to play games; you should be working, or so tired from working that you’re sleeping. That’s right, none of this Scrabble business. Me: Where do you see yourself in 5 years? Tane: This question?! Why does everybody—At this time?! Me: Just be creative, anywhere in the world. Tane: I’d be in a little cottage in the mountains of New Zealand, with a workshop out the back, and it definitely doesn’t include board games, I’ll tell you that! Me: So did you two deploy any tags on this trip? Me: Not an operator error? Tane: No Pete, definitely not an operator error, I mind you of that. Tane: They basically broke, the attachment that is, when we tried to tag the mantas. The guillotine swivel on the tip of the tag basically snapped under the initial force of installation. So after that happened a few times, we stopped attempting to tag. But we did biopsy all of the mantas. Me: Who has the better shot with the spear gun? You or Cam? Me: Hands down? Not even gonna give him a little credit? Tane: No, no credit given. Me: Would you trust him to shoot an apple off of your head. Tane: Not even, I would be dead, straight away. Me: Have you ever had any close calls with the guns in the water? Tane: Yeah, sharks trying to steal the fish from me off of the tip of the spear. Me: What’s next for you, after this trip? Tane : After this I’m headed straight to the Azores, to hopefully tag a few whale sharks, then back to the University in Saudi. As we throttle back on science deployments now that we are outside PIPA and continue on our last 400nm to Pago Pago, one can only admire the well-oiled machine that we, as a crew, have become over the last 5 weeks. We are an extremely diverse group, from all over the world, interesting and weird in the best way possible. Though the wilderness of the Phoenix Islands was spectacular and much can be learned from an environment so divorced from human interaction, for me, it was truly the people on board that made this trip so special. In a matter of days we will all scatter back to our various lives, but I know I will never forget my experience aboard the Seamans.